Contribution To The "American Dream"
A woman hand picks Kona coffee. The "American Dream" was founded on the principals and idealism of equality, determination and freedom. Often the "American Dream" is associated with European immigrants leaving economic privation and political and religious oppression in their homelands to build a new and better life in America. The thirty-eight million people, who emigrated to the U.S. between 1820 and 1940, endured hardship and uncertainty for the opportunity to build a new life. America's economic opportunity, religious freedom, and system of justice were powerful inducements to immigrants seeking a new and better life for their families. What is sometimes forgotten is the large number of Asian immigrants that also contributed to making the "American Dream" a reality. When Captain James Cook landed at Kealakekua Bay, he and his crew found a fertile agricultural region with an abundance of breadfruit, sugar cane, sweet potato, taro, and banana growing at elevations of approximately 1000 and 2000 feet. When the outside world learned about this exceptionally fertile region known as the Kona district, entrepreneurs began introducing new crops such as tobacco, pineapple, sisal, cotton, commercial sugar cane, and coffee. Of these experimental crops, coffee is the only commercial crop that prevailed through the many booms and busts in its long history, and is now recognized as one of the world's premier gourmet coffees. Coffee growing on Mauna Loa's slopes. Coffee first came to Kona as an ornamental in 1828, when a missionary introduced plant cuttings to the fertile growing region above Kealakekua Bay. The commercial success of coffee supported the establishment of large plantations by European and American planters in the Kona district, beginning in the 1840s. The first Kona coffee pioneers were American and European planters, and Hawaiian landowners. A diverse population of Caucasian, Hawaiian, Chinese, Portuguese, Japanese and Filipino laborers were involved in the production, processing and export of coffee between 1840 and 1945. By the 1890s, large coffee plantations were no longer economically feasible because of rising labor costs, crop surpluses and world market conditions. In response to the uncertain economic conditions, plantation owners began to divide large acreage into five-to ten- acre farms. Initially, Portuguese immigrants (1880s-1890s) worked the small coffee farms. It was during this same time-period that Japanese immigrants, who had either completed their contracts or were escaping from the harsh living conditions on the sugar plantations in Hamakua and Kohala districts, began to find their way to the Kona district. By the late 1890s, many of the Portuguese immigrants had diversified from coffee to starting dairies and ranches. Japanese immigrants filled the void left by the Portuguese. Many of the early Japanese plantation laborers were raised on farms in Japan, and the opportunity to work as independent farmers was attractive. At first, landowners and tenant farmers maintained a sharecropping relationship, with portions of the coffee crop owed to the landowner at the end of the year. Gradually, leasehold agreements were negotiated, creating independently operated farms and the paying of lease rents and taxes replaced giving a portion of the crop to landowners. The remote Kona district became a haven for Japanese immigrants disenchanted with life on the large sugar plantations. Kona offered the opportunity, with little capital required, to achieve financial and personal independence unattainable in Japan or on large plantations. A view of the preserved D. Uchida farm. 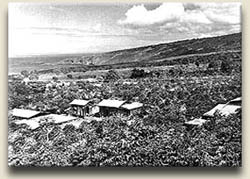 By 1910, nearly all the coffee land in Kona was being farmed by Issei (first generation Japanese immigrants) under tenant lease arrangements. As these immigrant pioneers established their place in Kona, they adapted traditional Japanese architectural and building techniques, agricultural methods, religious practices, and cultural ways of life to their new environment. Japanese farmers are credited for improving milling and processing technology and agricultural practices for Kona coffee. Within thirty years of their immigration, Japanese pioneers and their Hawaii-born children were the predominant population in the Kona district. The success of the Japanese coffee farmers encouraged other ethnic groups to become coffee farmers, creating a mosaic of cultures that shaped the Kona coffee industry, and helped create the multi-cultural "Kona coffee lifestyle," which still thrives today. Second generation (Nisei) Japanese-Americans born on coffee farms continue to farm lands cleared and planted by their parents, as do third & fourth generation (Sansei & Yonsei) Japanese-Americans, Filipinos, Hawaiians, and Portuguese. Starting in the 1970s, people of mixed ethnicity moved from the U.S. mainland and became part of the Kona coffee story by purchasing land and establishing coffee farms. After decades of hard work and struggle by past and recent pioneers, Kona coffee is renown worldwide as a premier coffee known for consistent body and rich full flavor. Hawaii is the only state in the U.S. where coffee is grown. A number of years ago, the Kona Historical Society, recognizing the importance of the Kona coffee farming story, initiated efforts to preserve this aspect of the multi-cultural heritage of Kona. 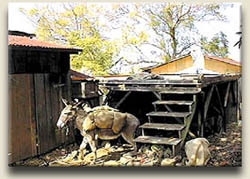 A donkey transports Kona coffee. The Kona Coffee Living History Farm keeps alive a rapidly disappearing way of life that is unique in American culture, yet typical in the district of Kona on the island of Hawaii. The Kona Coffee Living History Farm is the only living history farm in the state of Hawaii. The Kona Coffee Living History Farm captures the day-to-day experience of immigrants confronted with adversity, personal and cultural isolation and loneliness, and how they surmounted these difficult challenges to build families and associations that provided purposeful work, a sense of belonging, and a sense of place. The Kona Coffee Living History Farm preserves the story of what local folks refer to as "growing up in the coffee lands." Families working early Kona coffee farms strived to be self-sufficient, growing much of their own food and producing many goods with their own labor. The women supplemented family incomes through cottage industries such as sewing clothing, weaving lauhala, and preparing and processing food to sell. Kona coffee farm families placed a high value on frugality, hard work, and education. 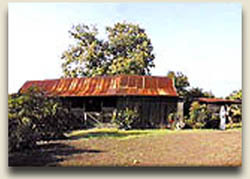 The Kona Living History Farm focuses on the stories, the lifestyle, and the roles of the Issei (first generation, immigrants) who laid the foundation for their children, Nissei (second generation, first generation born in Hawaii) and grandchildren, Sansei (third generation, second generation born in Hawaii), who even today are a major factor in the Kona coffee industry. Tour groups are small, usually with no more than twelve visitors per guide. The tours provide each person with a unique personalized experience of a family coffee farm during the years 1925 to 1945. Kona Coffee Living History Farm tour guides and interpreters welcome and interact with visitors as ohana (family). The "family visits" provide many opportunities for individual interaction and questions, allowing the visitor to savor the experience and delve into aspects of personal interest. 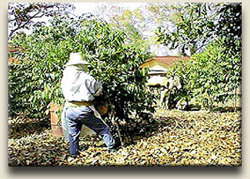 The Kona Coffee Living History Farm tours are about 2 to 2½ hours and will be provided by reservations only. The tours start with an orientation at the Greenwell Store Museum (Kona Historical Society Headquarters). 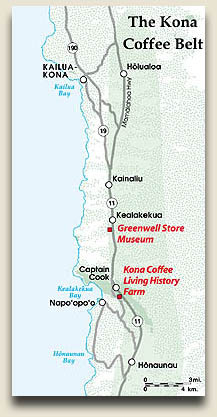 The Kona Coffee Living History Farm is located approximately three miles south of the Greenwell Store Museum in Kealakekua, South Kona on the island of Hawaii in the heart of the Kona Coffee Belt. Visitors to the Kona Coffee Living History Farm, which was homesteaded in 1900, are welcomed and greeted by uniformed guides and costumed interpreters. The animals to be seen on the Farm include a mild-mannered donkey named Hina, free-ranging chickens and friendly cats. Visitors will be guided through the producing coffee orchard, which include diversified plantings of macadamia nut, avocado, papaya and citrus trees. After the walk through the orchard, visitors will tour the original six-room, single-story farm house, coffee processing mill (kuriba), drying roof (hoshidana), and see the out buildings - water catchment tanks, a Japanese style bathhouse, outhouse, and chicken coop. Farm visitors are provided historically accurate interpretations, personalized attention, and treated to hands-on demonstrations by guides and costumed interpreters who engage visitors in meaningful activities and "talk-story" conversations. Visitors will tour the kitchen, which has changed remarkably little since it was first constructed. Visitors will see the stone fireplace where rice and vegetables were prepared, learn about the above ground plumbing, and how smoke from daily cooking on the wood-burning stove stained the interior walls black. Visitors will see many of the original handmade and modified tools, well-preserved household items and furniture, and the family vegetable garden and ornamentals. "Family visits" to the Kona Coffee Living History Farm are much more than tours, they are unforgettable, entertaining and highly educational visits back to a bygone era in Hawaii - to historic Kona, and a unique American way of life. "Readers may submit editorial comments to any of our stories by sending an email to les@lbdcoffee.com. We would be happy to attach your comments and feedback to anything we publish online. Thank you for your interest." Story appeared originally in Coffee Times print magazine and appears online for archival purposes only. Any use or reprinting of these stories without the expressed written consent of the author is prohibited.